Turn the oven to 350°F. Put the arugula, garlic, 1 tablespoon olive oil, lemon juice, cashews, salt and pepper in a blender. Process until smooth. If needed, add more oil or water. Heat 1 tablespoon olive oil in a sauté pan over medium heat. Add the shitake mushrooms and sauté them, stirring, until cooked. Sprinkle with salt and pepper. Spread the arugula pesto evenly over the 2 pita halves. Top with shitake mushroom slices, artichoke slices and small or medium sized chunks of goat cheese. 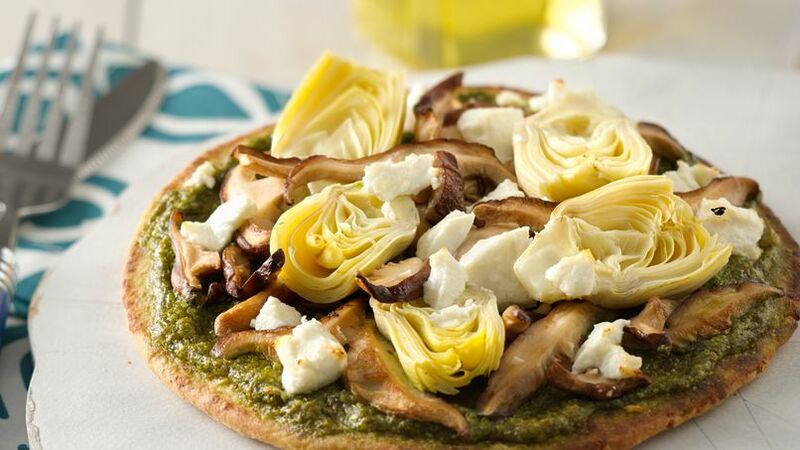 You can use regular pesto to make this pizza. If you don't have a lot of time to cook, you can buy it ready-made (try to find the best quality possible). Use any cheese you like, or a different kind of mushroom. Morena Escardo Preparing homemade pizza on pita bread is a great way to make a light and delicious dinner in minutes. This is so easy to make, that it's also the perfect meal to make if you're a beginner in the culinary arts, and also a wonderful way to get your kids interested in cooking and to spend some creative time with them in the kitchen. I love preparing my own pizzas. It's fun, you can change them every time, and, best of all, when they finally come out of the oven and you take a bite, they make you feel like you're eating something deliciously sinful (even though you're not!). If you're more traditional, you can go ahead and cover your pita with shredded mozzarella, top it with tomato slices and basil, and have a margherita ready in minutes. If you want something more impressive however, something that you can even serve at a dinner party, the sophisticated flavors in this recipe is what you need.